Fried mini doughnuts are dipped in a chocolate glaze and topped with chocolate sprinkles. They’re perfect for a weekend breakfast or a fun dessert. If you hang out on social media at all, you are probably very aware of the hashtag #tbt. If you’re not aware of that hastag, allow me to enlighten you. #Tbt stands for “Throwback” Thursday. This Twitter and Instagram “holiday” compels people to share photos from an earlier time in their lives. If you do a quick quick search for this hashtag you’ll find photos of awesome 80’s fashion, old school toys – hello, Lite-Brite and old school candy! I loved me some Hubba Bubba Bubble Jugs and Push Pops. I totally searched for Hubba Bubba Jugs a few weeks ago to discover they discontinued those jugs of powdery gum years ago. Girl ain’t gonna lie, if I found them online, they were most definitely going to be purchased. While I’m definitely not going to be sharing 80’s photos of me with a sweet perm and ridiculously high bangs, I am all about sharing recipes that remind me of my childhood. Earlier this month I posted a recipe for Honey Bun Cake which got me feeling all nostalgic about baking with my Nana. And I thought, why not share a couple #tbt recipes per month? I’ll be digging through family cookbooks and Nana’s recipe box to share some of our family faves with you, and I couldn’t be more excited about it. While discussing this topic with Eric, he immediately grabbed his grandma’s cookbook and started flagging recipes that we needed to make and share. First on his list were his Grandma’s donuts – which happened to be a Crisco Donut Recipe from 1916 that was passed down from his great-grandmother. This recipe seemed like a great place to start, so we rolled up our sleeves, made the dough, cut out shapes and did some deep frying! 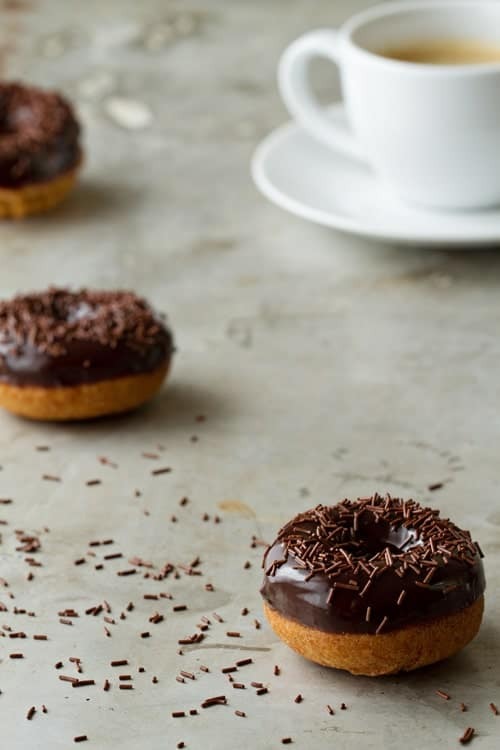 And because in Eric’s book a donut is not a donut unless it’s dipped in chocolate, that’s exactly what we did – and added some sprinkles of course! 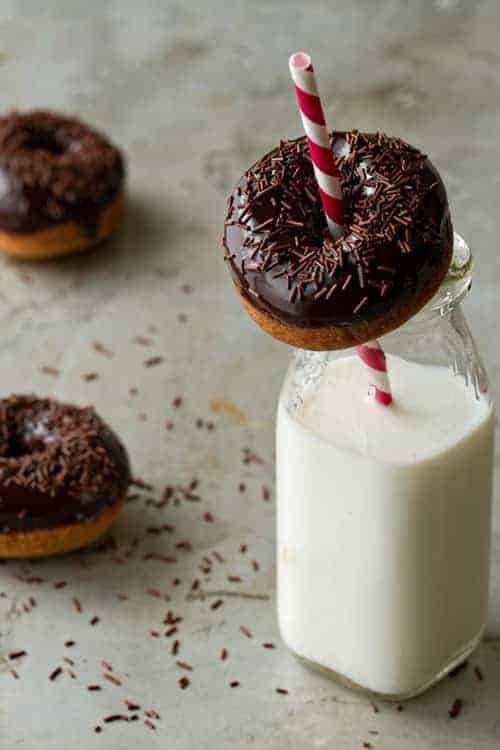 Eric enjoyed these Chocolate Glazed Donuts every Christmas during his childhood, and they even graced the breakfast table after a special sleepover. We hope you enjoy them as much as we did! If you happen to get a little inspired to create and share your own #tbtrecipe, be sure to tag me Instagram (@jamiemba) and Twitter (@bakingaddiction) – we’d love to see your creations! In a large bowl with an electric mixer, cream sugar and shortening together. Add in eggs and vanilla and mix on medium speed until combined. In a medium bowl, sift together the flour, baking powder, salt and homemade pumpkin pie spice. Add dry ingredients alternately with milk to the first mixture. Mixture should be very soft. Form into a ball, place on a well floured board and roll to one-half inch thickness. Cut into donut shapes. I used a small biscuit cutter for the large circle and piping tip for the hole. Heat plenty of canola oil in a large pot until the temperature reaches 375° F. Do not allow the oil to get much hotter than 375° F. It's a good idea to keep the thermometer in the pan to continually monitor the temperature. Gently ease 2-3 mini donuts into the hot oil. Allow them to cook 2 minutes on each side; they will brown very quickly. Remove donuts from the oil with a slotted spoon. Allow the excess oil to drip back into the pan. Place donuts immediately on several layers of paper towels. Flip them over to drain the oil from the other side. Repeat frying process with remaining donuts. Allow doughnuts to cool. 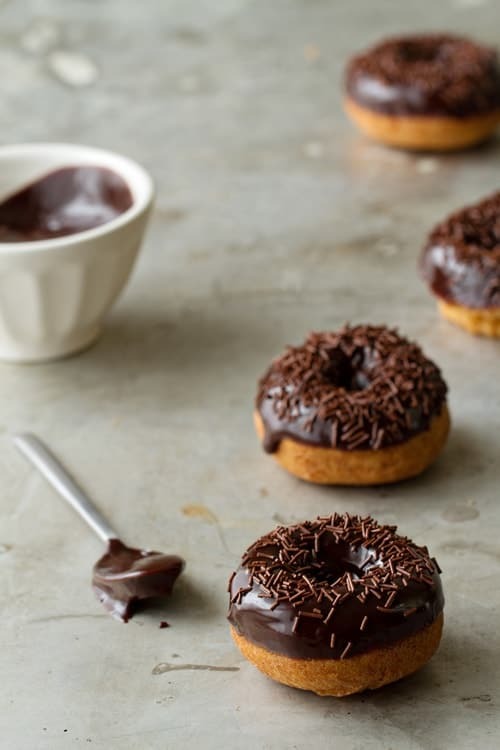 If desired, dip one side of donuts into chocolate glaze and top with chocolate sprinkles. Place chocolate chips in a heat safe bowl. Pour the hot cream over the chocolate and allow it to sit for about 5 minutes. Whisk the cream and chocolate until smooth and thoroughly combined. Whisk in the corn syrup, and vanilla. If desired, top with chocolate sprinkles. I love the idea of posting vintage recipes!!!!!!!!!! Me too, Debbie! I am so excited for these upcoming posts! Thanks for stopping by! Old family recipes are always the best. The sad thing for me is no matter how hard I try, how exact I follow the recipe, it never turns out like grandmas. She can even walk me through her recipes step by step and it will still be a far cry from what hers tastes like. Grandma pours some serious magic into her recipes I tell ya. Anywho, I love these donuts! Pinned! I totally agree with you Jen! Grandma’s version is always the best! Thanks for visiting! These doughnuts are gorgeous, Jamie! Thanks so much, Kristen – I appreciate you stopping by! Throwback recipes are my favorite kind. LOVE these gorgeous donuts! Mine too! I am pretty excited to be sharing some old school recipes! Thanks for stopping by! These are so pretty!! Loving this recipe! Yummy … these look amazing! My daughter would love these! Thanks so much for stopping by – have a great night! Looks delicious. I don’t want to re-live the 80s in any sense, but I can get down with this throw back recipe! YUM! Me either! Thanks for stopping by, Liz! Oooh chocolate glazed donuts are my favourite!!! I would substitute butter for the shortening and for the corn syrup try substituting simple syrup – 1 cup sugar with 1/4 cup water, heated until sugar is dissolved. Use 2 tablespoons of simple syrup for the corn syrup. I hope this helps. These doughnuts are beautiful and I’m sure they taste just as good! These look delicious! I wonder if they would be just as good baked? Thoughts? Awww, I miss Lite-Brites! And the necklace charms thingies. But oh man, these donuts look insane! I could devour like 10 of these right now. Pinning to try this weekend. Can’t wait!! thanks for the lovely recipe. but can i freeze the dough? I would not recommend freezing this dough. Thanks for stopping by. Thank you. can i substitute shortening with butter & leave out light corn syrup? I have never tried this substitution, so I can’t tell you how the recipe would turn out. Sorry I am not more of a help. Can I bake it instead of frying it? 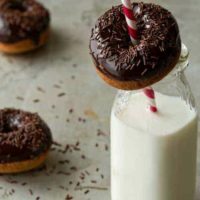 These donuts are best fried but you might give this recipe a try for baked donuts: https://www.mybakingaddiction.com/mini-baked-donuts/ Thanks for visiting! Do you use yellow crisco or white ? I used the white Crisco. Thanks for stopping by.